I’m so excited and a little more than slightly nervous to announce that I’m participating in my first ever One Room Challenge! 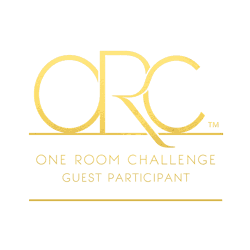 For those of you who are unfamiliar, the One Room Challenge is is a widely anticipated biannual event held every April and October that challenges bloggers to transform a room in 6 weeks. Sounds easy? Not so much! This round I’m joining in with the craziness as a Guest Participant. While I’m not one of the 20 official bloggers, I will be participating – and accepting the challenge – to renovate a room from start to finish. I’ll be posting updates right here on the blog every Thursday, so make sure you’re signed up for email updates (below!) so that you don’t miss a thing! By the way, if this is your first time here, WELCOME! My name is Jenna and I live just north of Boston with my husband, Brian and our 16 month old son, Cian. We moved into our current home this past December and have been busy working away on updating every inch of it since. You can learn more about me in the About Me section of the blog. 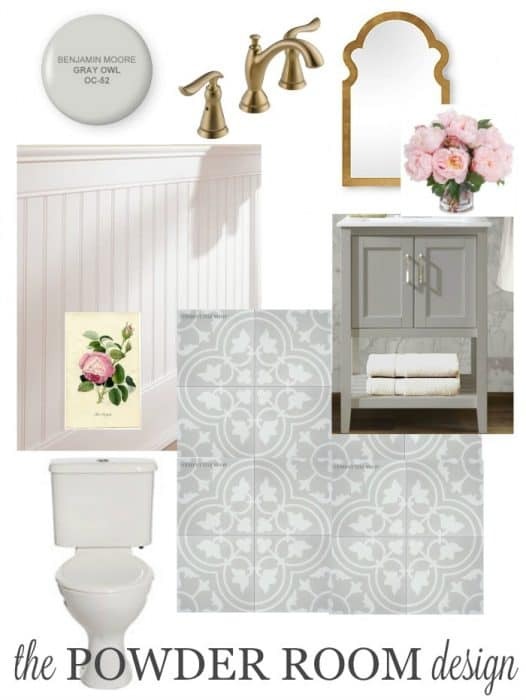 If you follow me on Pinterest, you’ll have noticed same MAJOR powder room pinning. You guessed it – I’m redoing our awful 1960’s brown powder room! Since it’s on the first floor, adjacent to the living room, this is the bathroom that anyone coming to our house uses. And it’s pretty ugly to say the least. 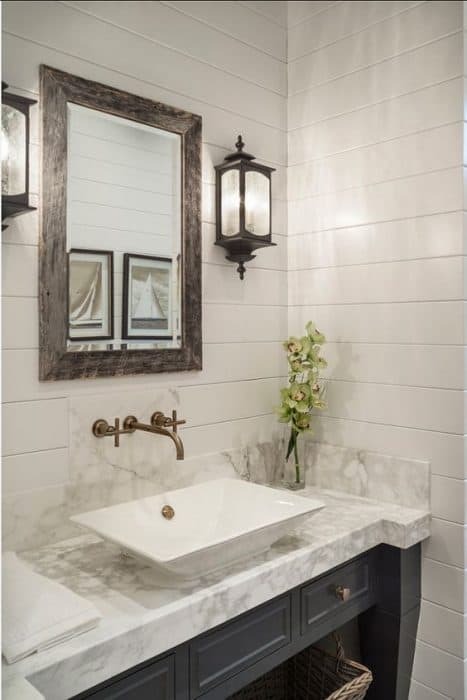 While the rest of the house is light, bright and airy, this bathroom is dark with brown everything – toilet (with a wooden seat no less), mosaic floor tile, ceramic wall tile and built in vanity and sink. Oh, and does your powder room have an attached toothbrush holder?! Minus the bathrooms, the rest of our house is neutral tones of gray and blue with lots of bright white. I’m sure our guests have probably been hoping we’d do this room soon rather than later! Do you notice some trends in what I pinned? 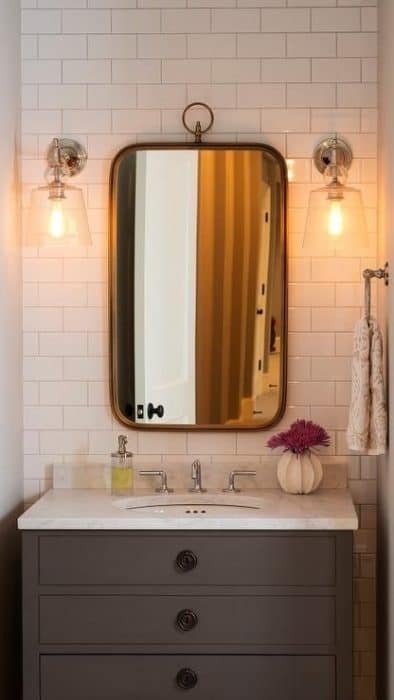 When I analysed everything, it was obvious that I wanted a gray vanity, a wall treatment and patterned cement tile. I also want this room to be FUN and unlike anything else I’ve ever done before. 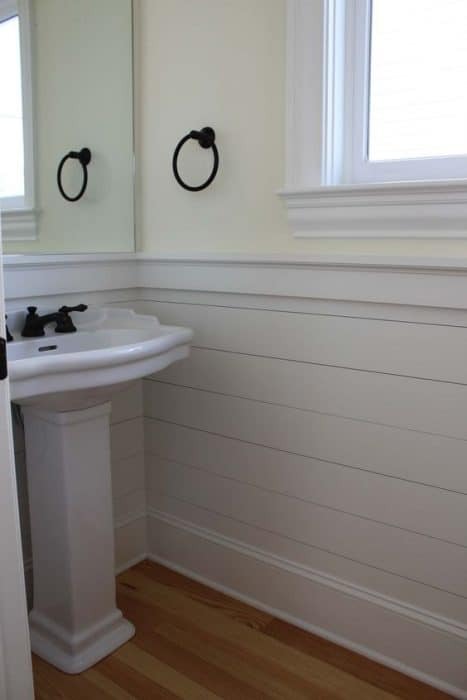 I’m still undecided about a few elements – namely the specific wall treatment, faucet color and paint. I want a horizontally oriented ship lap wall, but Brian wants vertical beadboard. I want champagne bronze faucet & hardware, Brian wants chrome. And I probably won’t pick the paint color until I see how everything else works together. So that’s it! The next 6 weeks are going to be hectic but hopefully worthwhile. First things first, we’ve got to begin the dirty task of demo! With floor tile that’s embedded in 2 inch thick concrete, things might get interesting! I’ll be posting sneak peaks to Instagram as the weeks progress, so make sure you’re following along. You can also sign up for email updates below so that you don’t miss any of the action! You can see what the other Guest Participants are up to for week 1 here. Now…Let the games begin!! 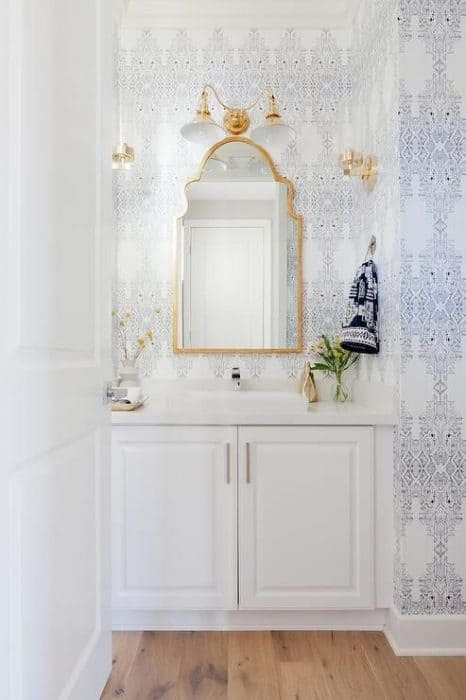 See all the Powder Room Posts! 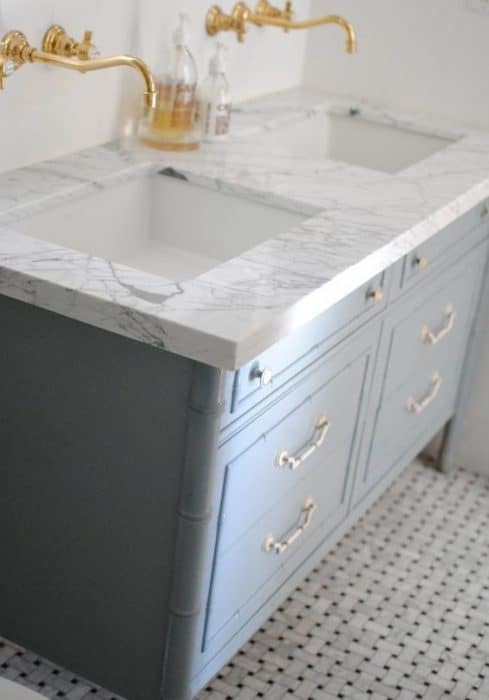 Jenna – your bathroom is going to be gorgeous! We can’t wait to follow along! Thank you! I’m so excited with how it’s going so far!! Love your plans for the space! It’s my first ORC too and I’m also doing our first floor powder room. Exciting! Thanks Lee, Good luck to you!! Welcome to your first ORC! I’m in love with your plan and your inspiration images. Good luck! I started following your blog recently and love it! 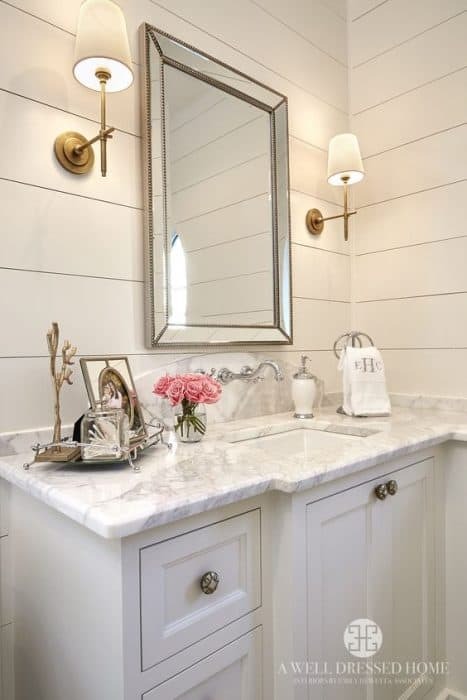 Looking forward to seeing the transformation of your powder room and fabulous home! Love all of the inspiration photos – especially the different patterns and neutral colors! I have not heard of cement tile, I’ll have to check it out! I completed my first ORC last fall and I am hooked. Best of luck, look forward to following along! Kelly, Google cement tile and prepare to be amazed!! Wow!! This will be an amazing transformation!! I can’t wait to see it unfold over the next few weeks. You go girl! Marble, brass, white, and gray looks like an AMAZING direction. So many of my favorite things. This is going to be a killer transformation! Thanks Melissa! Let’s hope my vision comes true! 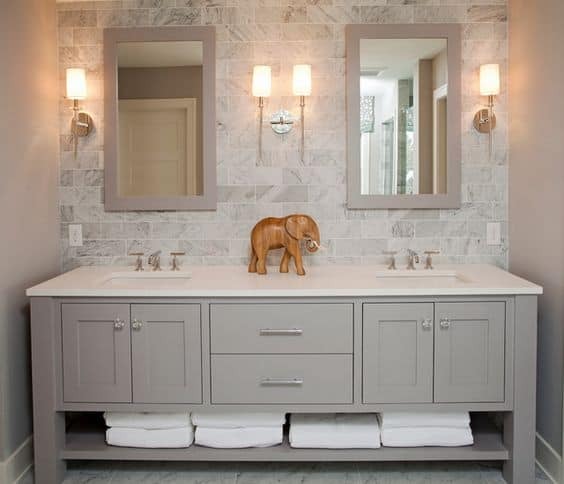 Grey cabinets in bathrooms are one of my favs. They add a spa feeling instantly. I love every single one of your inspiration photos. Good Luck! This is going to be one amazing makeover! I love, love, love your ideas for the spaces. Can’t wait to see how it turns. Thanks Erin! Fingers crossed it all goes to plan! 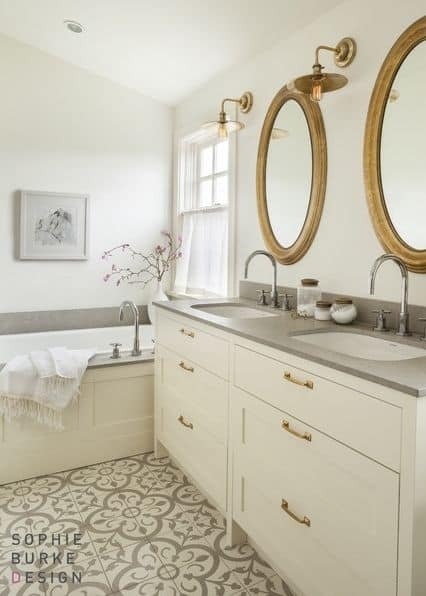 This is basically my dream half bath – you had me at cement tile! We are working on our master bath and are dealing with a similar color palate : ) Best of luck and can’t wait to follow along! Thanks Jodie! Isn’t cement tile dreamy?!! Good luck with your Orc too! This will be a great makeover! Love all of your inspiration photos. Can’t wait to see it all come together. 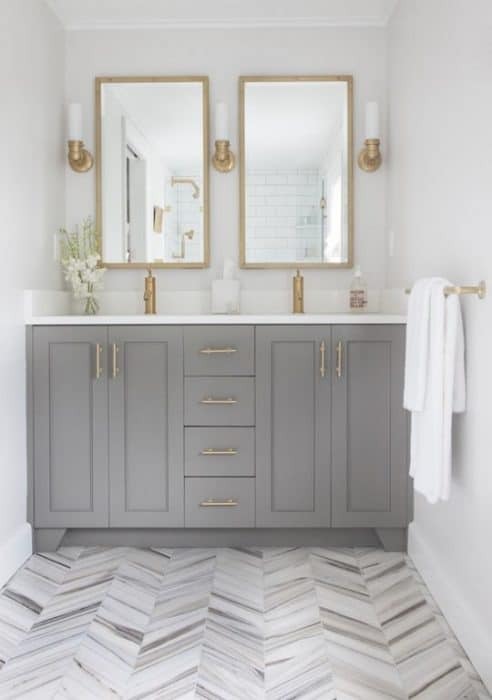 Can’t go wrong with grey & white – Love the floor tile! I’ll be following along while I also complete my ORC! Thanks Hollie! The tile is my favorite part :-) Good luck with your ORC! Not the best is an understatement! But yes, it should be nice when it’s done! Good luck, Mila! gorgeous inspirations! can’t wait to see it all get done! good luck! bathrooms are tough! Your inspiration rooms are beautiful and I have no doubt the ultimate result will be just as beautiful! 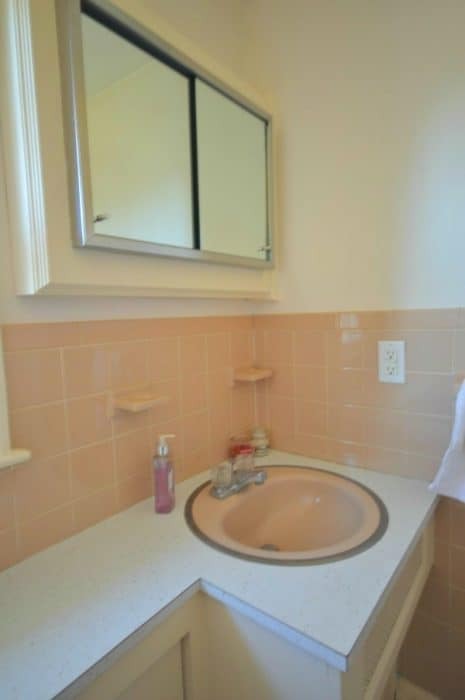 My previous home came with a bathroom that looked very similar (pepto bismol pink wall tile, pink tub tile, pink vanity, pink flooring) and it was such a huge difference once we finally renovated it – but it only took us about ten years after we moved in to do so! LOL I can’t wait to see your final result! 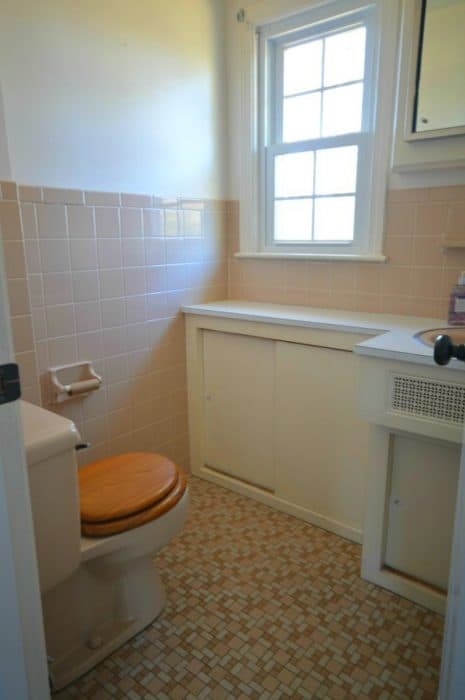 Ahhh yes…we have a pepto pink bathroom upstairs too! I’m glad tastes have changed :-) Thanks for stopping by, Tara! I can’t wait to see what you do! 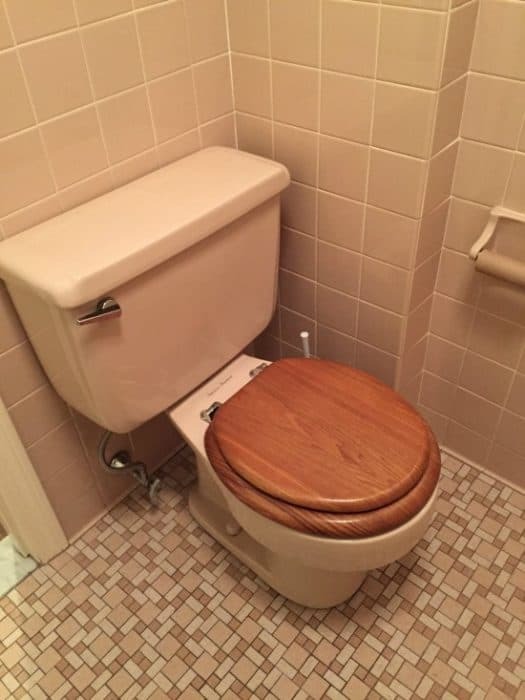 I love all the inspiration designs and know from experience how thrilling it is to get rid of a brown toilet! Gorgeous choices and inspiration pictures. 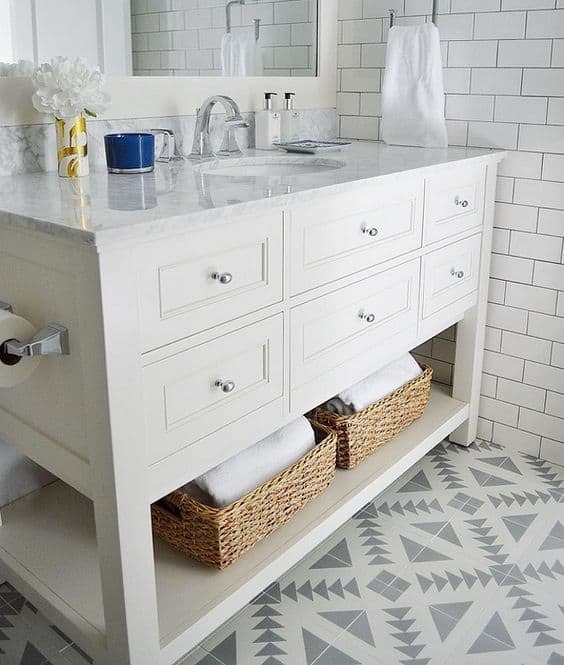 Love the gray and all of that cement tile inspiration! 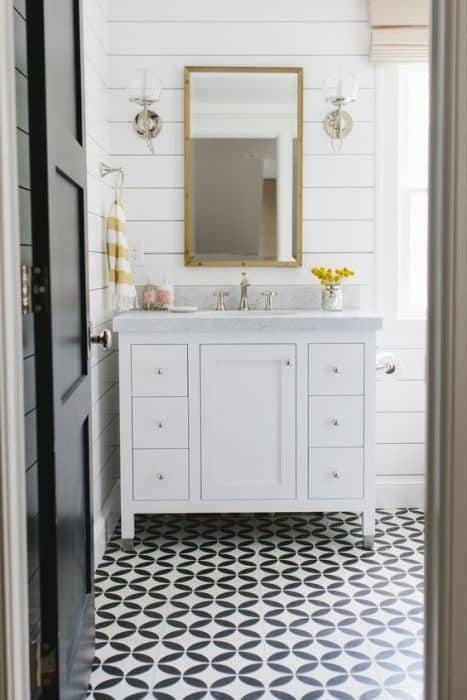 I’ll be using cement tile in my master bathroom makeover as well!